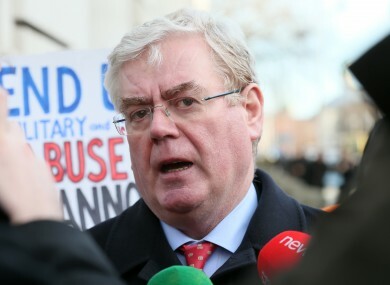 EAMON GILMORE’S GIVEN his response to this morning’s call from Labour MEP Phil Prendergast to quit the party leadership. Prendergast had called for the Tánaiste to resign from his position for the good of the party. Her move followed a poor result in an Irish Independent opinion poll, which put support for her candidacy in Ireland South at just 4 per cent. Speaking in Athenry, Gilmore said the MEP’s comments were “not helpful” and that he fully intended to continue leading the Labour party. He said the party was “determined to do the things that are necessary to bring about recovery — even if at times some of those decisions are not popular”. Over the course of the past three years, since the Labour party took on the responsibility of Government three years ago, we’ve had to take decisions that sometimes weren’t popular, but were the right decisions to make; that’s what leadership is about. Prendergast initially made her call for Gilmore to go in the Irish Independent. She’s given a series of interviews on the subject since the story broke this morning, including to RTÉ, Newstalk Breakfast and TheJournal.ie. There was also a larger-than-expected media turnout for a campaign event in Carlow this afternoon, where she was joined on the trail by Public Expenditure Minister Brendan Howlin. Other senior Labour ministers have been trying to avoid commenting on the issue, with Pat Rabbitte taking a unique approach to reporters’ questions on his way into an event earlier. Other party figures have criticised Prendergast for not ‘holding her nerve’ amid an ongoing series of bad opinion poll results. Email “Gilmore: No, Phil... I'm not quitting”. Feedback on “Gilmore: No, Phil... I'm not quitting”.